Published in the Chicago Reader. Reverend Billy is leaning against the counter of a Starbucks in Northridge, California. Dressed in a white suit and clerical collar, his gelled, dyed-blond hair swept skyward in a John Travolta pompadour, he could pass for a real man of the cloth—until he opens his mouth. A store manager pushes through the crowd and risks catching spittle by trying to put her hand over the reverend’s mouth. A congregation of a dozen supporters yells “Hallelujah!” as an ex-marine, deciding to act as store security, clutches at the reverend’s jacket. 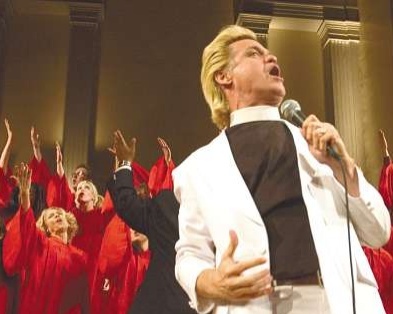 Reverend Billy, the charismatic leader of the Church of Stop Shopping, is the creation of New York performance artist and avant-garde theater veteran Bill Talen. His Jimmy Swaggart-like persona may be rooted in parody, but Talen—who draws inspiration from ACT UP, the Guerrilla Girls, Lenny Bruce, and Abbie Hoffman—approaches his work with unusual seriousness. The reverend is his main focus year-round; he even earns a modest living from the character, doing lectures and residencies with arts organizations. When his choir belts out lyrics like “So it’s Christmastime, now let’s stop our shopping / Consumer confidence, yes oh yes it’s dropping,” it shows off vocal chops honed in weekly rehearsals. And when Talen delivers his sermons he is genuinely red-faced and beaded with sweat. Now Talen is hitting the road with 30 fellow activists and performers for the “Shopocalypse Tour,” a month-long cross-country trek that started a few days after Thanksgiving in New York City and ends with an anti-consumerist Christmas celebration December 25 in Los Angeles. He hasn’t publicly announced the exact route—to avoid tipping off corporate security—but events are planned in Chicago, Minneapolis, and Dallas as well as a slew of smaller towns along the way. In Chicago the congregation plans on “twisted caroling” down the Magnificent Mile on December 7—and it’s bringing 100 extra robes so locals can join in. That evening he’ll read excerpts from his book at Left of Center Bookstore. Mess Hall in Rogers Park will host a Reverend Billy revival the following day. Do such actions have an impact? Given that mass protests targeting Starbucks have been scarce of late, it is unlikely that the chain’s sales will suffer much in the short term from Yippie-inspired theatrics. On the other hand, WalMart, another nemesis of Reverend Billy, has been taking some serious lumps recently. Notably, its efforts to erect stores in Queens, New York and Inglewood, California, a Los Angeles suburb, have been derailed by coalitions of anti-big-box community groups. “From the protests against store construction, to ‘slow food,’ to fair trade, which is really hitting its stride in Europe, resistance to consumerism is coming in different forms,” Talen says. Yet just when it all seems like a joke, the mania in his voice stills and Talen touches on a dilemma that many mainstream theologians grapple with as the holiday season grows ever more commodified: that, in our frantic rush for last-minute purchases, the mall can become its own glittering deity. Research assistance for this article provided by Kate Griffiths.